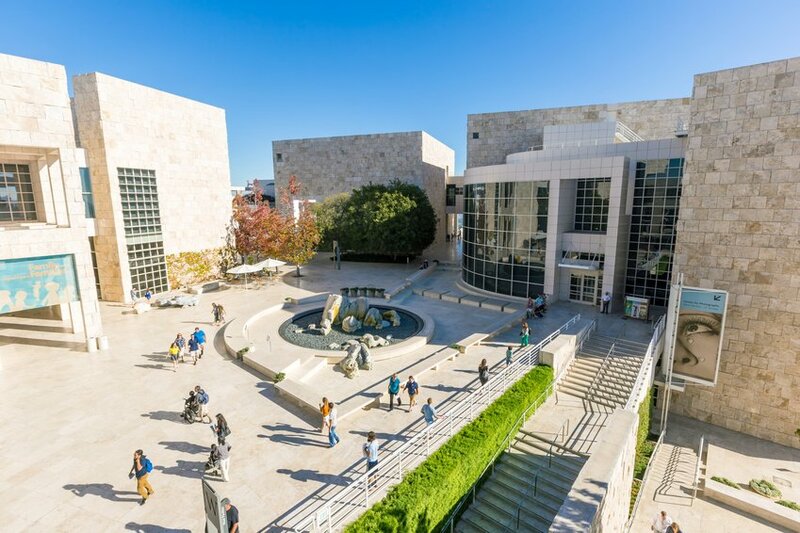 Getty Center is one museum well worth visiting during your time in Los Angeles and is one of the premier museums of Western European artwork in the Southland. 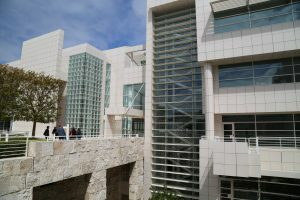 It is located off of the 405 freeway at 1200 Getty Center Drive. As you are driving north on the 405 you can’t miss it; it dominates the hillside above the valley. 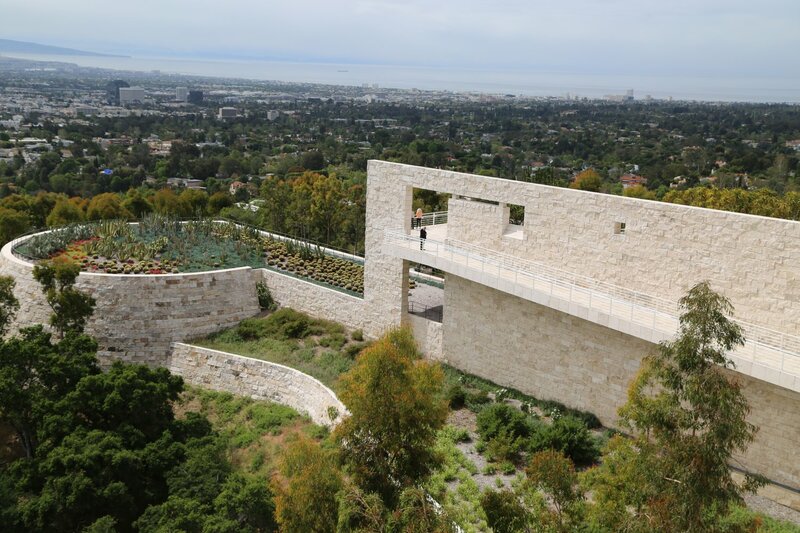 The actual Getty Center complex is constructed out of huge whitish blocks of Travertine stone. If you look closely at these blocks you will see that some of them contain small fossils. The price of admission as of the last update is $15 (listed as covering the cost of parking) – call it what you will, it is still an admission price. The museum takes no reservations. 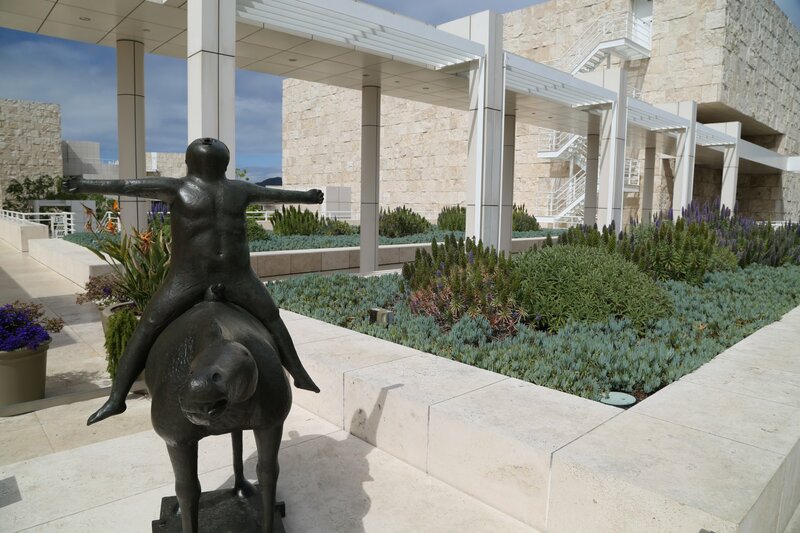 Note that the Getty Center is closed every Monday. If you are planning on visiting the Getty Center during a busy weekend or holiday, it is best to get there right around when they open which is 10am. Otherwise traffic can severely back up for a long ways on both sides of the Sepulvada pass – which is the main feeder road into the museum. The exit from the 405 for the Getty Center is called Getty Center Drive – and there is good signage for this exit. 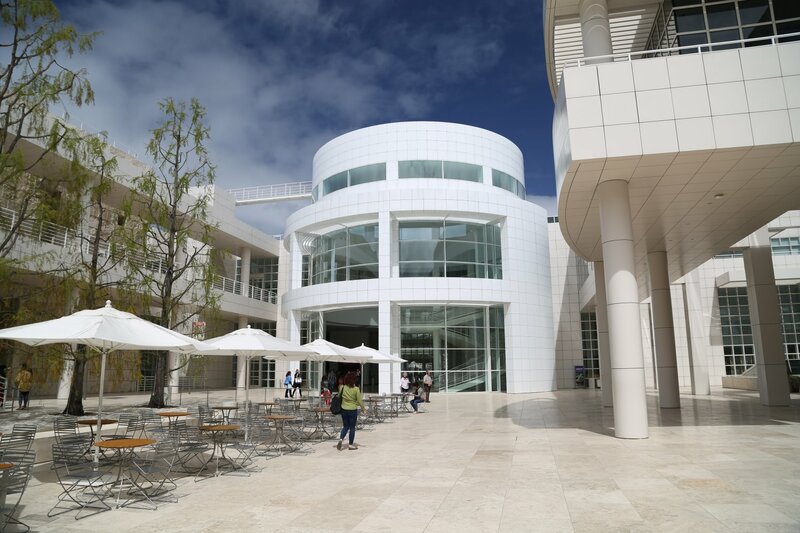 If you arrive at Getty early, you will be directed to park in the lowest levels of the garage. A nice elevator whisks you up to the tram station, where you will go through a simple security check and then board the tram. The tram ride is a smooth couple minute ride to the actual Getty complex located on top of the hill. You will exit to the right of the tram; be sure to stop at the kiosk and pick up your free map & guide as well as the brochure detailing the architecture and garden area. 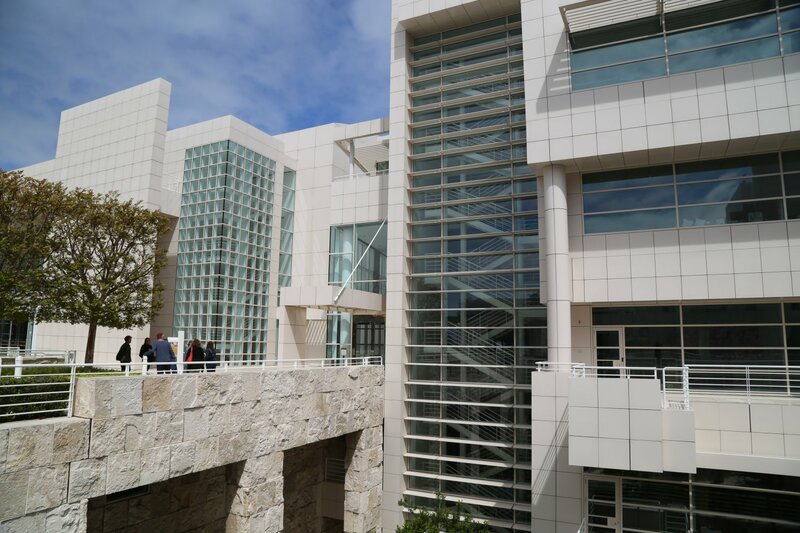 We have visited the Getty center six times. Each time we return it seems like they have added to and improved their overall exhibits. The exhibits are split up into four main Pavilions/buildings each designated with a direction (N, E, W, S). Each pavilion contains a Plaza and an upper level. In addition each pavilion houses a certain era of artwork (i.e. 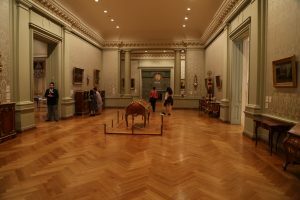 the North Pavilion contains artwork before 1600, etc.) All upper levels in each building contain only paintings. The Plaza or lower levels sculptures and other artworks. The permanent displays in all these buildings are collections of Western Art (mostly European & some American). 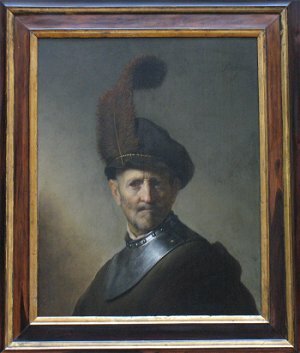 Some of the highlights are Rembrandts, Rubens, Degas & Van Gogh. An absolute must not miss are the original hand drawings and designs by Leonardo Da Vinci. Besides the four buildings mentioned above there is a separate building rotating exhibits. You can use a hand held camera only (no tripods), video or still in any of the main buildings. Flash photography however is not permitted. For digital you can set your ISO setting higher to compensate for the low light and in some instances for greater stability, balance your camera on top of the seats that are scattered throughout the galleries. Individuals who play the part of security, docents & or art buffs, are stationed in uniform where they are always watching every gallery. There is no particular order to the gallery – you can start with the oldest artwork first or the newest or skip some if you like. Once you get your fill of the artwork be sure to visit the outdoor gardens – there are some great photos here – also great views on a clear day of the Los Angeles Basin. Normally you can see the buildings of Westwood along and near Wilshire Blvd from the Getty overlooks unless it is really smoggy. Often you can see downtown on a clearer day. Outside patio dining is available in the main plaza between the Pavilions. There is also a restaurant and cafe next to the tram arrival plaza. 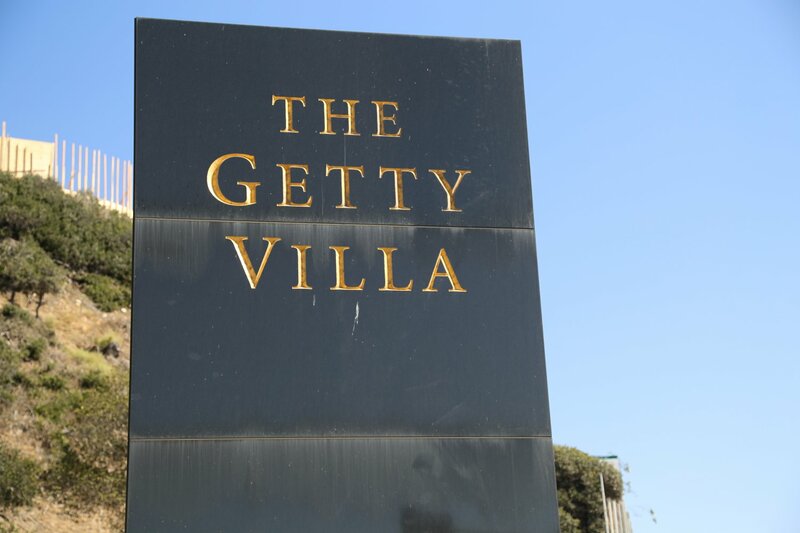 Getty Villa is located in Malibu right off of the Pacific Coast Highway (PCH) about a mile north of Sunset Blvd. 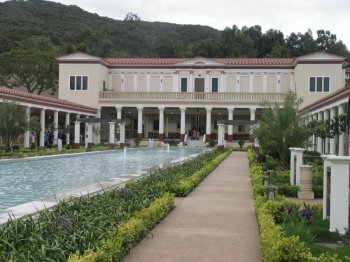 You can take the 10 west to Santa Monica and then drive north on Highway 1 (PCH) about 5 miles until you exit right into the Getty Villa. The Getty Villa is located at 17985 Pacific Coast Highway. 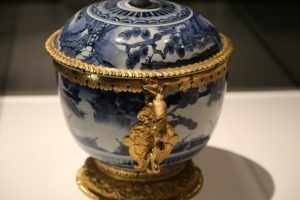 This museum is more intimate than its younger brother the Getty Center. It is nestled in a canyon rather than perched on top of a hill overlooking the LA basin and it is a much smaller museum than the Getty Center. It is built to resemble a Roman country house that was buried by the ancient volcanic eruption of Mt. Vesuvius in Central Italy. This is the original Getty museum and it features more than 1,200 works of art from the Romans, Greeks and the Etruscans. The works of art consist of sculptures, carvings, antiquities and other ancient relicts. 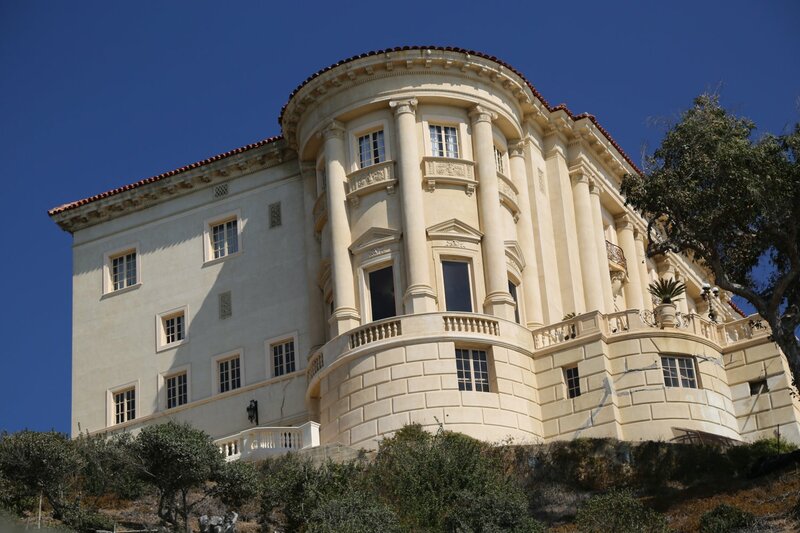 The “Villa” closed for renovation in 1997 and reopened in early 2006 after a major 200 million dollar renovation project. 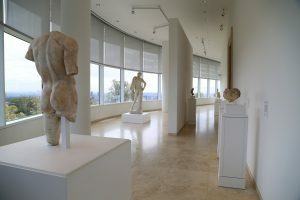 The works are organized by theme and are displayed in beautifully decorated rooms throughout the museum. Allow at least 3-4 hours at the museum. The Villa is open Thursday through Monday from 10-5pm, closed on Tuesday and Wednesday. Tickets are free but *must* be reserved ahead of time on their website. Tickets are extremely in demand and are often sold out months ahead of time. Parking is $15. Umbrellas are provided to you in case of rain – so no need to take your own. You should start your tour of the museum with a visit to the orientation film room – the film runs every 15 minutes and provides an excellent overview of the museum and its collections. 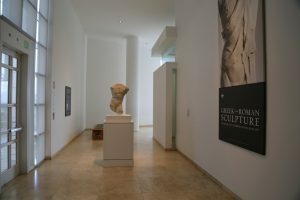 Events and guided tours are given every day – you will be provided with a printed “event card” and “gallery guide” before entering the museum. The museum is built so that there is an excellent blend between the outdoors and the indoors. There is a central open air courtyard with the rooms located off of this central area on both the ground and upper levels. 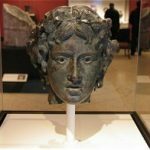 Be sure to visit the “timeline” room located on the ground floor on the south side of the museum – this provides an excellent historical perspective regarding the Roman, Greek & Etruscan antiquities housed at the museum. A “Family Forum” room is also a highlight if you are traveling with kids – it is also located on the ground floor – you can learn how to be an “ancient artist” through a variety of hands on displays. Lastly, consider picking up a “Getty Guide” which is an audio player which will provide information about the antiquities as you make your way throughout the museum. 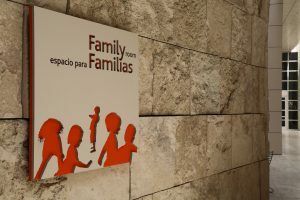 This audio guide is available at the main info desk on the first floor to your left when you walk in the main entrance. The main outdoor attraction is the Outer Peristyle. 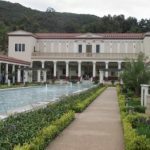 This is where the famous photos of the Getty Villa are taken. On a clear day this area is absolutely spectacular. 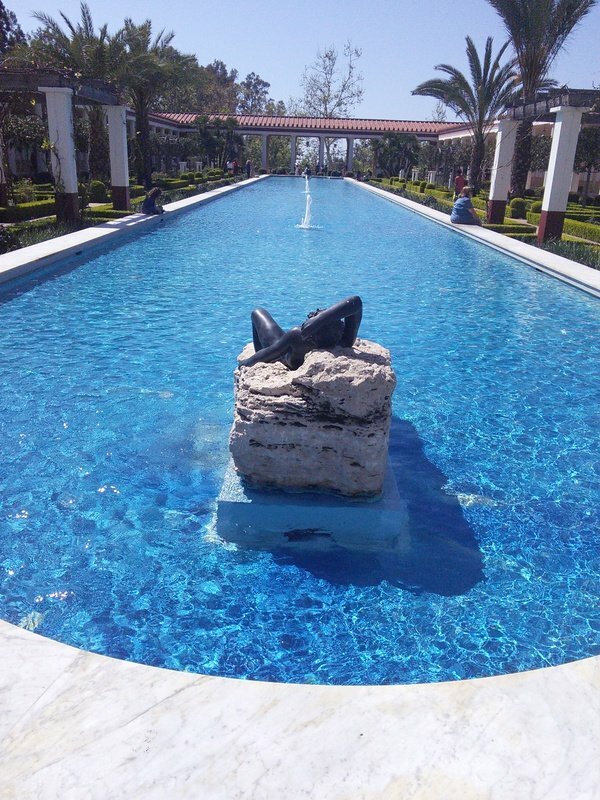 A long pool with statues at both ends lies in the middle of gardens and walkways – all of which are surrounded on the sides by columnar covered walkways and brightly painted walls. A cafe and museum store are located right next to each other, adjacent to the main amphitheatre. In the summer, this outdoor amphitheatre is used for a variety of productions including concerts, performances, and lectures. Hand held cameras are permitted but you are not allowed to use a flash.